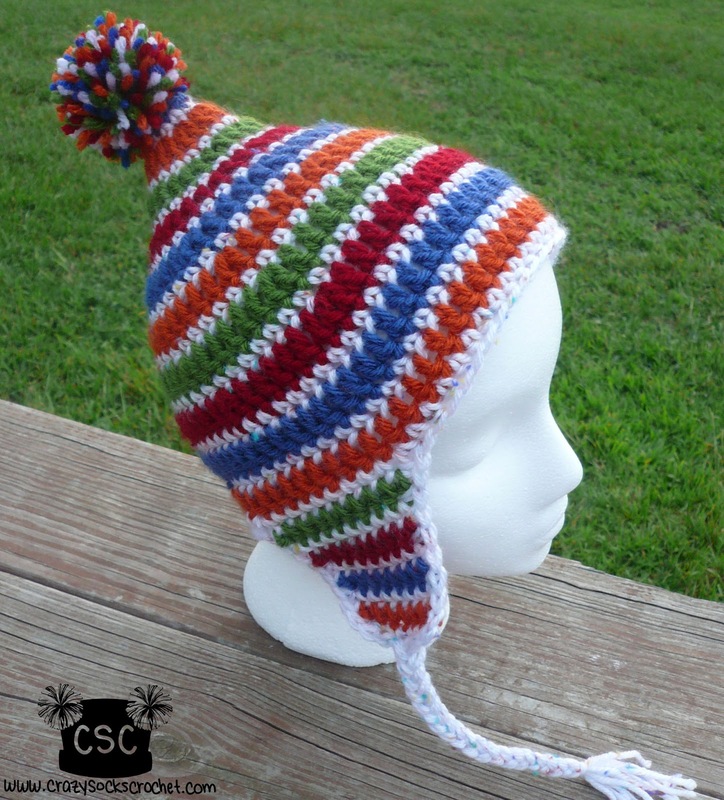 This Circus hat is a fun, pointed earflap hat for toddlers. I recommend making them in several bright colors with contrasting trim. This pattern is easy, but there are a lot of color changes. MATERIALS: I (5.5mm) hook, 5 colors of WW yarn, scissors, yarn needle, pom pom maker. NOTES: When joining at the end of each round, complete the last stitch of the round by pulling up the final loop with the next color. I also recommend carrying MC along the inside of the hat instead of fastening off each time you use it. The CH-1 or CH-2 at the beginning of each round does NOT count as a stitch. Using CA, start with magic loop. Round 1: CH 2, 8 DC in ring, join. (8 DC) Change to MC. Round 2: CH 1, SC in each DC around, join. (8 SC) Change to CB. Round 3: CH 2, 2 DC in each SC around, join. (16 DC) Change to MC. Round 4: CH 1, SC in each DC around, join. (16 SC) Change to CC. Round 5: CH 2, *2 DC in next ST, 1 DC in next ST* around, join. (24 DC) Change to MC. Round 6: CH 1, SC in each DC around, join. (24 SC) Change to CD. Round 7: CH 2, *2 DC in next ST, 1 DC in next 2 STS* around, join. (32 DC) Change to MC. Round 8: CH 1, SC in each DC around, join. (32 SC) Change to CA. Round 9: CH 2, *2 DC in next ST, 1 DC in next 3 STS* around, join. (40 DC) Change to MC. Round 10: CH 1, SC in each DC around, join. (40 SC) Change to CB. Round 11: CH 2, *2 DC in next ST, 1 DC in next 4 STS* around, join. (48 DC) Change to MC. Round 12: CH 1, SC in each DC around, join. (48 SC) Change to CC. Round 13: CH 2, *2 DC in next ST, 1 DC in next 5 STS* around, join. (56 DC) Change to MC. Round 14: CH 1, SC in each DC around, join. (56 SC) Change to CD. Round 15: CH 2, *2 DC in next ST, 1 DC in next 6 STS* around, join. (64 DC) Change to MC. Round 16: CH 1, SC in each DC around, join. (64 SC) Change to CA. Round 17: CH 2, 1 DC in each SC around, join. (64 DC) Change to MC. Round 18: CH 1, SC in each DC around, join. (64 SC) Change to CB. Round 19: CH 2, 1 DC in each SC around, join. (64 DC) Fasten off. Keep Right Side of hat facing you at all times; do not turn at the end of each row. Fasten off after each row. Depending on size made, join colors in sequence where you left off. Right Flap - Starting at back seam, count 9 STS to the left. Left Flap – Starting at back seam, count 20 STS to the right. Follow same instructions as right flap. Join MC at back seam with SL ST, HDC along to edge of 1st ear flap. SC evenly around ear flap, putting 2-3 SC in each corner. HDC along front of hat to edge of 2nd ear flap. SC evenly around ear flap, putting 2-3 SC in each corner, join with SL ST and fasten off. BRAID TIES (make 2) – Cut 6-9 lengths of yarn. String through each of the middle 3 SC’s at the bottom of the ear flap. Separate into 3 strands, braid it & tie off at the bottom. Add a pom pom to the top (not too big, or it will weigh down the point) and you're done! That looks great! Do you have any suggestions on how to make a similar one to fit a larger, adult head?